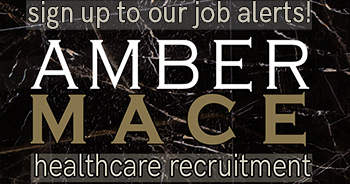 Amber Mace is your specialist healthcare recruiter across the UK, where we network extensively with people in the industry, to ensure we can find the very best talent when companies are recruiting. We have a team of experienced and dedicated consultants, who each have their own geographical area in the UK they cover, which means you get the very best people in your area. This also means that we have exciting and exclusive new roles for candidates who are looking to make the next step in their career. Amber Mace is your specialist healthcare recruiter, here to help fill any positions you might have within your business. We have a pool of talented and eager candidates ready to join your team! Our approach at Amber Mace sets us apart from the other recruitment solutions out there as we take the time to understand the needs of your business. We work exclusively with permanent staff that have experience and qualifications to match the requirements of your roles. We know how hard it can be to find the right candidate for your company. If you require assistance recruiting for any of the below positions, please get in touch. We understand how hard it can be to choose the next step in your career and here at Amber Mace, our Regional Consultants can assist you in making your next move and ultimately, the right move! We have over 10 years’ experience and a proven track record working with market leaders, to the smaller independent care companies, giving you the choice and variety you deserve. We will be with you every step of the way, from the first call finding out about you and what you are looking for, to your first day in your dream role and beyond! Call us and find out what the team at Amber Mace can do for you! We believe clients deserve better and if you do too, then get in touch and discover why. We’ll reply to any enquiry shortly.